These are not the best of times for "the yellowest house in El Dorado Hills." Two years ago, when Michelle Valencia spotted the bright ranch-style home in the wooded Crown Village neighborhood, it spoke to her like a childhood dream. "I loved it. It reminded me of the house I grew up in -- a yellow ranch-style home," said Valencia, who moved to El Dorado Hills from the Bay Area community of Belmont. "It brought back memories -- warm, fuzzy memories. I told my Realtor that if it's as cute on the inside as on the outside, we're buying." That's when her problems began. color brings back "warm, fuzzy memories"
officials say the house is too yellow. Her story, told in hues of yellow and other tints, is a cautionary tale about suburban community standards and the enforcement of CC&Rs -- those little-understood Covenants, Conditions and Restrictions -- imposed on many homes. A member of the Community Services District's design board reviewing Valencia's application for a new roof went to see her house. She got an official letter. You can't have a new roof, it said, because your house is too yellow. Valencia appealed to the design review board and lost. She appealed again to the El Dorado Hills Community Services District's board of directors. She lost again, on a recent 3-2 vote. "As far as I'm concerned, it's the yellowest house in El Dorado Hills," said Norb Witt, a member of the district board and a liaison to the design review committee. Witt used to live in the house next door before Valencia moved in. His house was a grayish beige. Valencia has been ordered to repaint her house to get a roof permit. She says it will cost $2,800. So far, the design review board has rejected colors -- yellow or otherwise -- that she prefers. She submitted a tan, a brown and muted shades of yellow that won approval. Yet after painting test samples, she couldn't stomach any of them. She doesn't want mellow yellow. She wants a new roof. The stalemate continues. "Is this blackmail?" Valencia asked. "It's harassment. They know they've got me. I appealed to the CSD. I said my children are at risk from our roof -- because if one spark hits our roof our house will burn down, as well as my neighbor's. They (CSD board members) said, 'Yep, that's a problem. You better hurry up and paint.' "
In 1983, voters in El Dorado Hills passed a ballot initiative -- Measure B -- that gave the Community Services District power to enforce the CC&Rs. The restrictions cover everything from what color residents can paint their homes to the type of landscaping they put in to where they can park their cars or boats -- even the shape of their mailboxes. Many of the CC&Rs were drafted by subdivision developers as quality-assurance measures for buyers and were then turned over to the Community Services District to enforce after the builders left. The fast-growing Serrano community is enforcing its own standards, maintaining muted earth tones in its suburban tracts and rigidly controlling front-yard landscaping. James Burling, an attorney for the Pacific Legal Foundation, which specializes in property rights and constitutional law, says home buyers may skim over CC&R agreements they sign and have no idea they are signing away their independence. "There is a growing concern, especially in California, that it's very difficult in some communities to buy a home without voluntarily giving up your rights and being subject to the whims of a typical busybody community," Burling said. Burling said the Community Services District's refusal to issue Valencia a roof permit unless she repaints is highly unusual. "I have never seen a case where someone would withhold permission for an unrelated aspect of the home, such as repairing a roof, until you fix another existing violation," Burling said. But Witt said that policy is an essential tool of the CSD and its design review board for enforcing compliance with community standards. No one complained when the previous owners repainted the yellow house a brighter shade to prepare it for sale. But the owners didn't seek the permission of the Community Services District. And no violation notice was issued -- until the design review committee member came out and saw Valencia's house. "I would have a fit if someone painted a house that bright," said Witt, who says that he had moved out of the house next door before the home was repainted. "To me that looks like Oakland or San Francisco. ... If you tried painting a house that color in Serrano, they'd run you out on a rail." 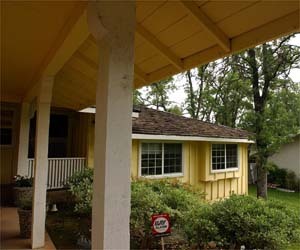 In Crown Village, a mid-1960s development that is one of El Dorado Hills' oldest, neighbor Marsha Frost said Valencia's house -- yellow with white trim -- looks just fine from across the street. "It's like happy sunshine," Frost said. "They're punishing her -- and she didn't even paint it." Valencia, who insists there are plenty of houses in El Dorado Hills more yellow, said she would suffer a financial hardship from having to repaint. The design review committee told her she could repaint the front of the house now and the back and sides later. There is no list of sanctioned colors -- approval depends on the whim of the committee. So far the panel hasn't liked Valencia's shades of yellow. She did get approval for a creamy yellow, but decided it was too white. She painted an approved mustard yellow shade on a small area of her home. "It was like dijon. It was horrible. I cried," Valencia said. Exasperated, she asked to paint her house teal -- like a neighbor's house color approved several years ago. But current design board members don't like teal. They turned her down. So she's still looking at colors. She's also noticing some eccentric restrictions in her CC&Rs. For example, one guideline in the seven-page document says there should be no mailboxes with "brightly painted support devices ... which simulate human or animal figures" or other characteristics "inharmonious with surrounding development." "I have a bunny painted on my mailbox," Valencia said. "I'm waiting to get a notice on that."